Preheat oven to 400�F. In bowl, combine egg whites and whisk until bubbly. In another bowl, combine bread crumbs and cheese. Cut each breast of chicken into 3 pieces. Dip each piece into egg whites, then roll in the cheese-bread crumb mixture. Place in a parchment-lined baking dish and cover with foil. Bake chicken in preheated oven for 25 minutes, then remove foil, baste with 2 tablespoons of melted butter, and cook 10-12 additional minutes, or until chicken is cooked through and coating is golden brown. While chicken is cooking, melt 2 tablespoons of the butter in a saucepan over medium heat. Add the flour and stir until the mixture is pasty and hot. Add chicken broth and whisk fast until thoroughly combined and no lumps remain. Add cheese and stir until cheese is melted completely and mixture is smooth and creamy. Add more broth if needed for desired consistency. Add pepper to taste. Remove from heat, cover and set aside until chicken is ready to serve. Remove chicken from oven and place on platter. Drizzle sauce over chicken. Top with fresh parsley. Serve and enjoy! Cheese, cheese, and more cheese! 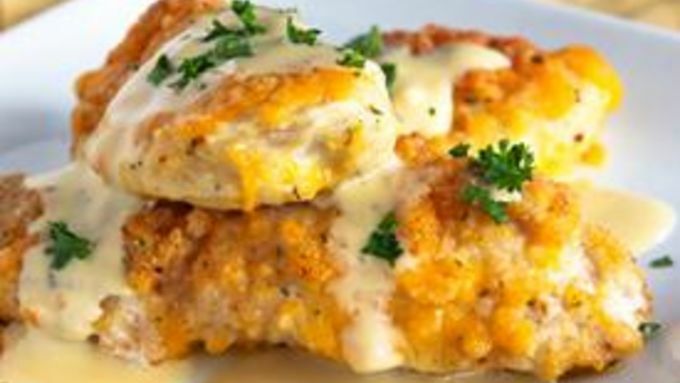 That's the secret behind this yummy recipe for cheesy baked chicken.